"What’s In the News" with Bob Van Ryzin starts off the December 24th episode of Coin Chat Radio with details about the intense demand and availability of the 2009 American Eagle Gold bullion coins. Next up in the program is another interview of coin dealer Julian Jarvis by Numismatic News Editor Dave Harper. Jarvis was most recently on Coin Chat Radio in October. The two start off discussing the gold market of late. "Well, one thing about the gold market is that it never stays the same," replies coin dealer Julian Jarvis when asked about it. "It’s either going up or going down. Right now, we seem to be having some corrections in the market. I don’t really understand it myself. How certain things that shouldn’t really affect the price of gold does, and vice versa." "I’m still selling gold almost on a daily basis," states Jarvis when Harper inquires as to the specific market of gold coins. "Availability is still good, as far as securing supplies … premiums have held very firm, particularly on bullion type gold cause the US Mint can’t seem to make enough Gold Eagles to meet the demand. They just released enough of the fractional Gold Eagles that the distributors and those that were able to get coins from distributors … somebody’s making a lot of money off of them, not the small dealer like myself." Jarvis continues that he was only able to get a portion of the fractional Gold Eagles that he wanted, and had to pay almost twice as much of a premium as he expected. He stated that he is charging a 10% premium himself on 1/2 ounce Eagles and a 12% premium on the 1/4 ounce. Harper and Jarvis also talk about the silver coin market to which Jarvis states that demand is "holding up well." With the spot price of silver dropping, few sellers are on the market. Closing out the interview, Harper changes direction to the America the Beautiful Quarter series to which Jarvis warns that if distribution does not start off smoothly for the new issues in 2010, he thinks collectors will not be drawn into it. Jarvis refers to the 2009 Lincoln Pennies as an example of how poor distribution has affected consumer interest resulting in poor consumer knowledge of their existence. "Freshly Minted" with Online Editor Lisa Bellavin reveals news of the Czech Mint‘s Vertumnus Medals based on the work of artist Guiseppe. Gold and Silver versions are available. 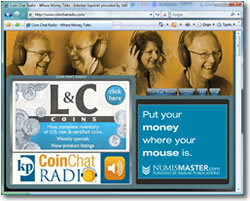 To hear this episode of Coin Chat Radio, visit their website at www.coinchatradio.com. Previous episodes may also be found there.